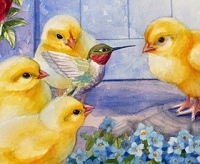 Besides Ferdinand and Nina, four other yellow chicks live at Tulipa Farm each with their own personality. Though none of them are quite as adventurous as the two wanderers, they are all close friends. When Ferdinand and Nina go missing, they are the first to try to find them. Edgar is the oldest. He puts on a brave front as long as he’s sure everything is safe. He is a take-charge type and likes to be the hero and order others about. Camille is a sassy one, skeptical and quizzical. She has her own viewpoint and will not always agree with the others, especially when Edgar is telling her what she should do. Georgia is a dreamy, artistic type and is sometimes in her own little world. She will stop and smell the flowers as the other chicks run ahead to supper or on to the next exciting thing. Sometimes she gets lost in wonder at the world around her. Oscar is the youngest chick so he is regarded as the baby. He gets left behind often and is used to wandering close to home by himself. 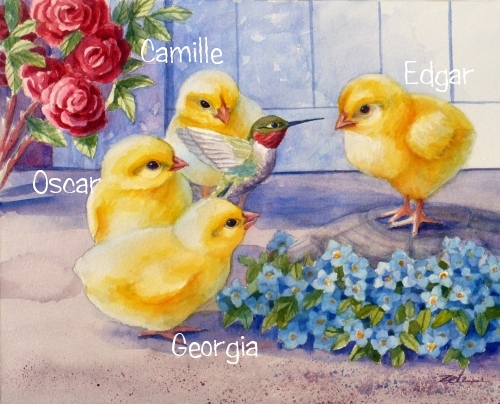 The problem is," said Edgar as he jumped up onto a rock to get everyone's attention (as the oldest of the chicks, he felt it his duty to take command in a crisis). "The problem is that two of us are missing. Has anyone seen Ferdinand and Nina?"